**Yahoo Basic Plan does not support WordPress. The data reported and opinions expressed in this review are based on our purchase of the Advanced Plan. There’s precious little that’s average about Yahoo’s Small Business Hosting. Aside from the price and guarantee, they earned either very-high or very-low marks in our web hosting criteria evaluations. Yahoo posted top marks for disk space, bandwidth, uptime, support, and BBB rating. They posted poor marks for ease-of-use, speed, and satisfaction. And while the 3.5-star rating average is quite common, we are not in the business of recommending mediocre web hosting services. On balance, Yahoo Small Business Hosting has earned the NCM Online designation of NOT RECOMMENDED. Yahoo! — the well-known news and information portal, slash e-mail host, slash search engine — offers three reasonably-priced shared web hosting plans: Basic, Advanced, and Premier. All three include a free domain name for the life of the account (12-month, 36-month, and 60-month plans only), Yahoo Site Design Tools, and $100 in ad credits towards the Yahoo Bing Network. All three plans are backed by 24/7 e-mail and phone support as well as a 30-day satisfaction guarantee. The cheapest of the three plans, Basic, renews at only $4.99 per month for a 12-month plan. It includes 100GB of disk space, 1000GB/month of data transfer (bandwidth), up to 10 site pages, and up to 250 e-mail addresses. It is limited to one domain plus up to 100 subdomains. Notably, it does not provide FTP or SFTP access or a file manager, nor does it support WordPress. The next-cheapest plan is Advanced. It renews at $7.99 per month for a 12-month plan. It includes 500GB of disk space, 5000GB/month of data transfer, unlimited site pages, and up to 500 e-mail addresses. It is limited to one domain plus up to 500 subdomains. It does provide SFTP access and a file manager, and it does support WordPress. It also includes “virtually unlimited” databases, password protection for site pages, site search capability, snapshot backups, and a shared SSL certificates with 256k (bank-level) encryption. Programming languages supported include PHP 5.3.6, Perl 5.8.7, and MySQL 5.1. The costliest of the three plans, Premier, renews at $11.99 per month for a 12-month plan. It includes all of the Advanced Plan’s features while adding unlimited disk space, unlimited data transfer, and up to 1000 e-mail addresses. While it is Yahoo’s priciest shared plan, it supports only one domain (with up to 500 subdomains). Yahoo Web Hosting Control Panel. Click to enlarge. There’s nothing quick or easy about the Yahoo web hosting sign-up process. In fact, we found it to be downright painful. We have presented it below for informational purposes, but feel free to skip down to the “SETUP” section. The checkout process begins after selecting a plan and term from either the Hosting Overview or Hosting Plans page. While it is our practice to purchase the cheapest available shared plan for purposes of testing and review, we selected the Advanced Plan as the Basic Plan does not support WordPress. The checkout process begins with the selection of a free domain name. As we would be using a domain we already own — with our plan, we clicked the “use your domain” text link. The next page asked us to enter the registered domain to be used with the hosting account. We did and then had no choice but to click the “Search” button, as it provided the only way forward. Why we would need to search for a domain name we already owned was beyond our level of comprehension. We clicked the “Search” button to continue the checkout process. The next screen informed us of something we already knew, our domain name was available for use with the account. We clicked the “Continue” button. The next screen presented us with the domain name “who-is” info, and asked us to verify the domain. We have purchased a lot a web hosting, but this step was something we had never encountered before. We checked the “I have reviewed the details above and confirm I own this domain” box and clicked the “Continue” button. The next page presented us with two added-cost options (DudaMobile Premium at $9.00 per month and Norton™ Secured Seal at $47.88 per year) for use with our hosting plan. We passed on both and clicked the “Continue” button. The next step provided us with the opportunity to review our order. We did and clicked the “Continue” button. The next screen provided us with two options: sign in with our Yahoo account, or create a Yahoo account. There was no other way forward. So whether or not you want a Yahoo account, in order to purchase Yahoo hosting, you must have a Yahoo account .While we have no use for such an account, we clicked the “Sign Up” text link in order to proceed. This caused a pop-up screen with a Yahoo account sign up form to appear. We completed the form and clicked the “Create account” button. The next step was to verify our account using the phone number we had just entered in the Yahoo account sign up form. We did so and were redirected to the Yahoo account sign in page. With no other available choice, we signed into our new Yahoo account and were redirected back to the checkout process where we clicked “Continue” button. The next page provided a Yahoo Wallet payment information form. On a positive note, a PayPal payment option was available, and we used that to complete the nothing-less-than-arduous Yahoo Web Hosting checkout process. 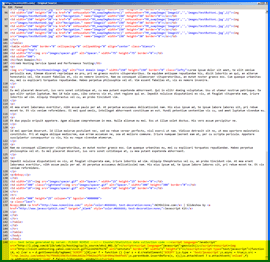 NCM Test Site source code with Yahoo Live Web Insights script (highlighted in yellow). We’re not particularly fond of hosts who add scripts to our web pages without our knowledge or consent. Click to enlarge. Only moments after submitting our order, the “welcome” e-mail arrived in our Yahoo inbox as no other e-mail options are available. The message did not include the information required to set up our website quickly — nameservers and FTP information. It did however, include links to billing information, the online help center, the Business Control Panel, and instructions on activating our domain name. We clicked the Business Control Panel link, which provided a link to the Web Hosting Control Panel (see screenshot above right). From there we clicked the “Manage” tab which provided access to the File Manager. Using the File Manager, we were able to upload our test site (click for sample test site). The “Manage” tab also includes the FTP information, but it should be noted that you must have a secure FTP client (SFTP) in order to use FTP with your Yahoo hosting account. We opted to use the Control Panel’s built-in File Manager instead. The Yahoo Web Hosting Control Panel is not as fully-featured or as intuitive as cPanel or vDeck. Accessing even common functions requires moving between tabs. 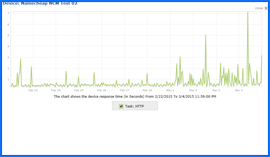 Speed and uptime testing for our Yahoo hosted NCM Test Site began on 2/22/15 and concluded on 3/4/15. While our testing reported 100% uptime throughout the 10-day testing period, the page-load speed results for our simple 1-page test site were not good. (See uptime and speed test results charts below right). Yahoo Web Hosting 10-day Uptime Test Results Chart. Click to enlarge. Having had previous experience with Yahoo shared hosting, we recalled that it was often tedious to use, but it was fast. Why were our current speed test results so slow? We decided to explore the matter further. 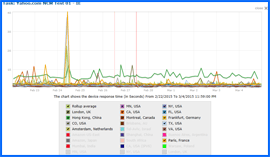 We contacted our speed and reliability testing service (Dotcom Monitor), and asked them to take a look at the problem. They responded with the answer we sought. Yahoo shared hosting accounts currently utilize a script called “Live Web Insights.” This application provides traffic and analytic site data. Whether or not you want Live Web Insights on your site, the script is automatically added to the code of every Yahoo-hosted page. We called Yahoo Support (twice) to ask them to remove the script from our test site. They told us that it was automatically added by the server to all Yahoo-hosted web pages and could not be removed. See Live Web Insights script screenshot above right. Yahoo Web Hosting 10-day Speed Test Results Chart. Click to enlarge. All web hosting services reviewed by NCM Online are purchased and subjected to our 10-day test for uptime and speed. One of the slower hosts tested to date, Yahoo Web Hosting recorded an average speed of 2.3539 seconds to load our test site from 13 locations worldwide, and 1.7561 seconds from 7 U.S. locations. Tested for uptime every 15 minutes over 10 days, Yahoo produced a perfect 100% reliability score. We asked ourselves how could a company with such a wealth of resources get web hosting so wrong. We could come up with only one answer — arrogance. Similar to 1&1 Internet and Web.com, Yahoo’s hosting services appear to have been designed from the company’s perspective rather than the user’s. Despite a number of excellent features, ease-of-use and page-load speed issues prevent us from endorsing Yahoo Web Hosting at this time. Yahoo has earned 3.5 stars and is not recommended. Cheap website hosting company price comparisons based on 1-year term list price before coupon/promo codes or limited time/introductory offer discounts. These are the renewal rates for the second year of hosting. To ensure that you receive the most affordable Yahoo Web Hosting pricing possible, please visit our Web Hosting Coupon Codes page for current discounts and special offers before making any purchases. Yahoo is a global Internet corporation that offers web hosting services. The firm was created by David Filo and Jerry Yang in early 1994 and incorporated a year later. It is now lead by CEO Marissa Mayer and headquartered in Sunnyvale, California. The company is world famous for its portal to the web, its search engine, and related Yahoo branded service offerings, including webmail, a social media website, web groups, advertising, news, finance, online mapping, video sharing, fantasy sports, the Yahoo Directory, and Yahoo Answers. News sources report that about 700 million people access Yahoo websites each month, while the company claims it attracts over half a billion consumers monthly in over 30 languages. It clearly is one of the leading web companies in the U.S.
Yahoo web hosting’s roots began in 1999 with the company’s purchase of the well-known GeoCities free webhosting platform. Two years later Yahoo! premiered its premium paid hosting services at GeoCities and decreased the data transfer rate for the free and low-priced hosting accounts. The paid hosting accounts were later transferred to the Yahoo! Web Hosting service and given higher data transfer limits. Yahoo discontinued the GeoCities services in October 2009. Today, Yahoo Small Business offers low-cost hosting plans for individuals and small businesses that range in price from $3.74 per month for the Basic Plan to $299.95 per month for the Professional Ecommerce Plan, which includes hosting for up to 50,000 product pages. While perhaps a bit impersonal, Yahoo’s hosting has become known as a fast, reliable, and affordable service for individuals, budding commercial concerns, and internet marketers. All Yahoo web hosting plans include a free domain name; easy-to-use online site-building tools; professional pre-configured website designs; dynamic content tools; social media integration; 24/7 phone, email, and online support; and a 30-day web hosting satisfaction guarantee. The basic hosting services include ecommerce integration applications; professional website statistics and reporting tools; and mobile-site conversion tools. Ecommerce plans come equipped with numerous extras including fully customizable shopping carts; coupon and gift certificate capabilities; customer tracking software; a search engine optimization wizard; integration with popular third-party software such as Adobe GoLive and Adobe Dreamweaver; and access to a professional third-party developer network. Based on the popularity of their hosting services and the company’s extensive resources, it would appear that Yahoo Small Business will remain a formidable competitor in the web hosting industry for the foreseeable future. This video tutorial will show you exactly how to install WordPress on your Yahoo shared hosting account using their proprietary control panel and applications installer.